When there's rain, can mosquitoes be far behind? "Mommy, what's that black... what's that black on your leg?" It's still the rainy season here and these insects abound. I don't have to tell you what deadly diseases they can bring -- dengue, malaria among others. In the past few days alone, I slapped a few big ones with my bare hands and lots more have escaped me. Every hit I make, I feel success! In my own tiny way, I'm trying to protect my loved ones from their treacherous bites, at least in our home. So pardon me for posting these photos here, I just can't help myself. I caught really big ones! These were taken in three different hits at home, and it's only now that I got to see these suckers up close. Check out these pesky creatures as I took pleasure in their 'downfall'! I recently found a new 'friend' in GIGA Insect Repellent Spray -- a Mom-Find for P165.00, in a 100ml bottle spray. The spray contains natural fruit extract distillate, lemongrass oil, patchouli and lavender oils. A lot of GIGA products are made from virgin coconut oil and I have yet to try them out. This spray also claims to be DEET-free, so it is safe to use on children. Though the scent is a bit strong, it effectively wards off mosquitoes. According to Sciencedaily.com, the active ingredient in many insect repellents, deet, has been found to be toxic to the central nervous system. Researchers say that more investigations are urgently needed to confirm or dismiss any potential neurotoxicity to humans, especially when deet-based repellents are used in combination with other neurotoxic insecticides. Read more about this here. I always use this on my boy before he goes to school since among all of us, he seems to attract mosquitoes the most! As my mom would say, maybe he has "sweet blood". Let's be vigilant. Sounds heavy huh, but we can't be too careful... we'll never know 'coz it may not be just a small harmless bite or a red spot after all. 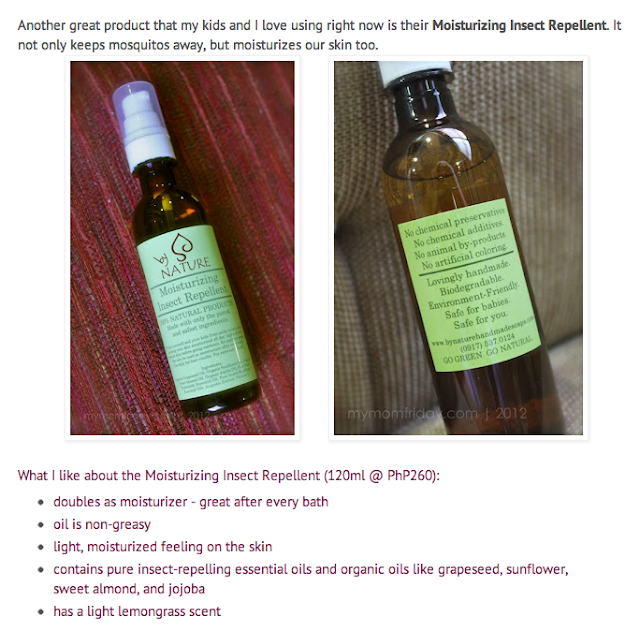 We've started using By Nature's Moisturizing Insect Repellent because of it's moisturizing properties and milder scent. Read my full feature on By Nature products here.